This past weekend I went to a baby-que....what seems to be the latest trend in baby showers. It's a Jack and Jill style baby shower, where, rather than sit in a circle cooing over the baby and eating finger sandwiches with females of all ages, you bring your whole family and eat delicious BBQ, drink tasty bevvies, and generally have a great time. I even went to one a few weeks ago where there was a keg. I hope this trend is the wave of the future. I enjoy these significantly more than the sit-in-a-circle-pass-the-cards-and-presents-around type of showers. Anyways, for this particular baby-shower, I was delighted to be asked to bring dessert! 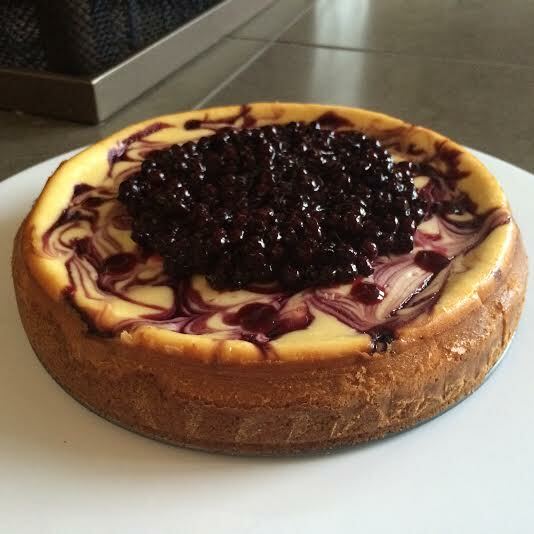 I thought a cheesecake was in order, as well as a couple dozen cupcakes (which I won't write about here). I already spammed Facebook and Instagram with a photo of my daughter decorating said cupcakes, so that's plenty of internet action on that already. **Note that this makes MUCH more than you actually require. Save the rest in your fridge for a couple of weeks to put on pancakes or waffles! Or, just eat with a spoon when no one is watching. First, make the saskatoon filling by combining the water and sugar in a small saucepan. Bring to a boil and let simmer for two minutes, stirring occasionally. Add the berries and lemon juice. Bring back to a boil and allow to simmer for about 15 minutes. Remove about 3 tbsp of hot liquid from the berries, and combine with the cornstarch in a small bowl. Return to mixture and stir to thicken for about 1 minute. Remove from heat and allow to cool. Combine the graham cracker crumbs and melted margarine. Press into the bottom and about an inch up the sides of a 9-inch springform pan. Bake in a preheated 325F oven for about 10 minutes. Meanwhile, beat cream cheese and sugar in a stand mixer (or using a handheld electric mixer,) until light and creamy. Beat in cream, vanilla, and flour, and then scrape down the sides of the bowl. Beat in eggs one at a time, beating until just incorporated after each addition. Scrape down the side of the bowl to ensure all batter is an even consistency. Pour half of the batter over the graham crust. Dot 1/4 cup of saskatoon filling in various places on top of the batter, and then cut through it with a butter knife, swirling it throughout the batter. Pour the remaining batter on top, and then repeat with about 1/4 cup more filling as before. 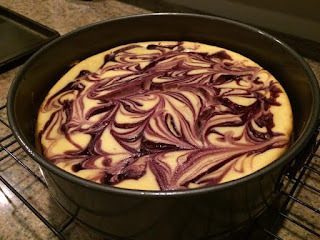 Place cheesecake in the center of the oven, and bake for 20 minutes. Decrease heat to 300F, and continue baking for 25 minutes. 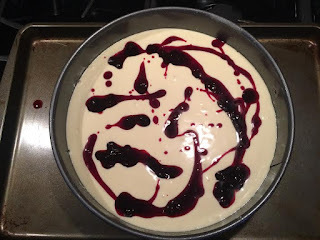 At this point the cheesecake should appear set, and jiggle slightly in the middle. 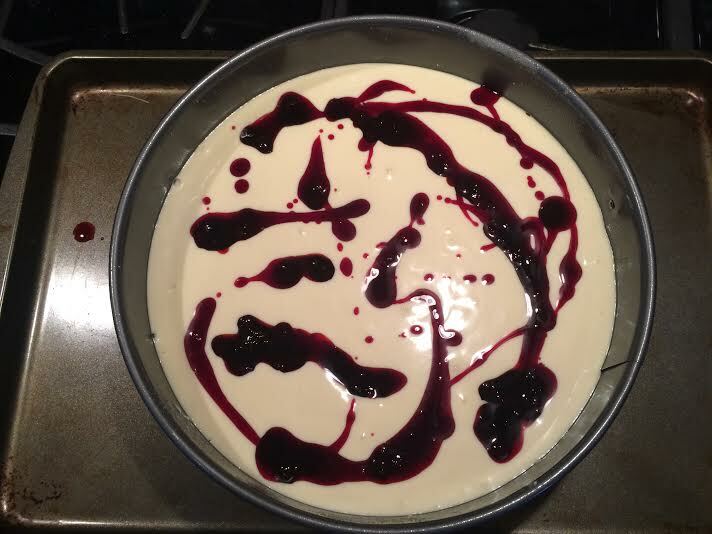 Then, turn the oven off, and allow the cheesecake to remain in there for 2 hours. Resist the urge to open the door, as your cheesecake will finish setting up with the residual heat. Remove from the oven and allow to cool for about an hour longer on a wire rack, and then cover with plastic wrap and refrigerate. Thoroughly chill before serving. I recommend AT LEAST 3 hours. Cut and serve with berry topping.